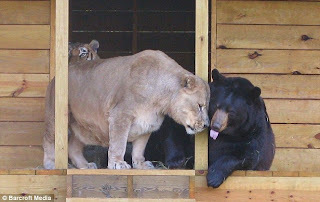 Your Daily Cute: Lions and Tigers and Bears, Oh My! They make an unlikely trio, but Baloo the bear, Leo the lion and Shere Khan the tiger have forged an unusually strong bond. Considering that they would be mortal enemies if they ever were to meet in the wild, it is stunning to see their unique and genuine friendship in these intimate pictures. 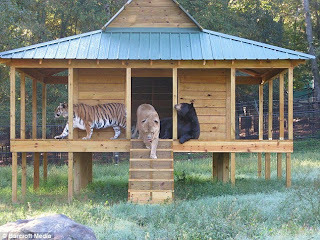 Rescued eight years ago during a police drug raid in Atlanta, Georgia, the three friends were only cubs at the time at barely two months old. Delivered to the Noah's Ark Animal Rescue Center in Locust Grove, Georgia the decision was made to keep the youngsters together, because of their budding rapport. "We could have separated them, but since they came as a kind of family, the zoo decided to keep them together," said Diane Smith, assistant director, of Noah's Ark. "To our knowledge, this is the only place where you'll find this combination of animals together." Living with the zoo's founders for the past eight years, Shere Khan, Baloo and Leo have now moved to a purpose-built habitat where the U.S. public can now witness first hand their touching relationships. "We didn't have the money to move them at first," said Diane. "Now their habitat is sorted and they have been moved away from the children's zoo areas where the public couldn't really get a good look. It is possible to see Baloo, who is a 1,000-lb bear; Shere Khan, a 350-lb tiger; and Leo, who is also 350 lbs, messing around like brothers. They are totally oblivious to the fact that in any other circumstance they would not be friends." Handled by Charles and Jama Hedgecoth, the zoo's owners and founders, the three friendly giants appear to have no comprehension of their animal differences. "Baloo and Shere Khan are very close," says Diane. "That is because they rise early, and as Leo is a lion, he likes to spend most of the day sleeping. 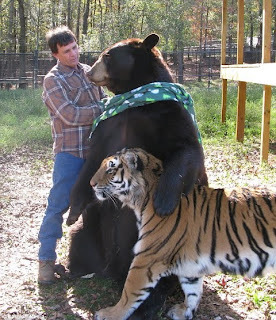 It is wonderful and magical to see a giant American Black Bear put his arm around a Bengal and then to see the tiger nuzzle up to the bear like a domestic cat. When Leo wakes up the three of them mess around for most of the day before they settle down to some food." Surprisingly for three apex predators with the power to kill with a single bite or swipe of a paw, they are very relaxed around each other. "They eat, sleep and play together," said Jama. "As they treat each other as siblings they will lie on top of each other for heat and simply for affection." "At the moment they are getting used to their new habitat. Shere Khan is being quite reticent about the move, but Baloo, the bear, is very good at leading him on and making him feel comfortable and safe." Explaining that the three "brothers" have always seemed to share a unique bond, Charles said: "Noah's Ark is their home and they could not possibly be separated from each other. You just have to remember who you're dealing with when you are with them. It's when you forget that these fellows are wild animals that you get yourself in trouble." The trio's new habitat had to be constructed carefully, in order to accommodate its occupants. Jama said: "The clubhouse had to be very sturdy for the guys, because they all sleep in it together. We had to include a creek, because the tiger and the bear both like to be in water." 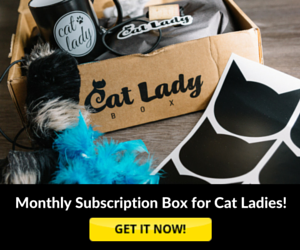 Special thanks to Cute's friend, Cyndi, for sending this cute email! That's so cute, who knew a drug baron could foster such sweet friendships? That really is an amazing story. I would like to make the trip to see that. Thanks for sharing that with us. I think that proves that friendship is often born from the strangest of circumstances. They made my whiskers grin up! That's a lovely story but what pigs to have tried to make pets out of such magnificent animals. Wild creatures are not meant to be pets. What a beautiful story. Thank goodness dey were rescued and can still live together. They should be an inspiration for the rest of the world. What a sweet story!